Welcome to A-1 Discount Vitamins, Natural Health and Supplements Store. We specialize in high quality supplements at discount prices! We offer free shipping in the USA for all orders over $50. Place order on line or call us toll free at (877) 291-8263. With many health conditions on the rise, people are becoming more and more conscious of what goes into their bodies. Whether you are using diet and exercise to maintain or improve health, or pursuing alternative medicine to seek answers to specific problems, you should consider looking outside the box for solutions. For some consumers, natural supplements and vitamins are a healthful way to boost immunity, fight disease, and live a healthier lifestyle. One major health issue facing many Americans is cancer. Though this disease is the leading cause of death among Americans, many treatment options are only partially effective, leading many people to turn to natural supplements as a partner in their battle against cancer. Whether taken as part of a preventative measure or in conjunction with existing treatments, natural supplements and vitamins can help you live a healthier life. 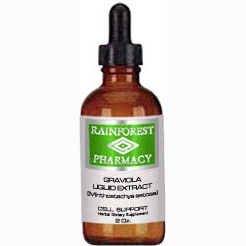 Graviola is one supplement that has received a lot of media attention recently for its benefits. It grows in South America, where the fruit, roots, and leaves have long been harvested for their medicinal effects. Traditionally, the leaves were used to kill various parasites and to aid in the healing of wounds; the roots have fever-reducing properties, and the fruit can help combat diarrhea. 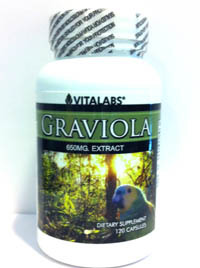 An herbal extract contained within graviola can help strengthen the digestive system and boost the immune system. Increased immunity means a reduced risk of diseases, including viruses. A stronger immune system can also catalyze cellular regeneration and promote healing, which is why extracts of graviola have traditionally been used in parts of South America to dress wounds. In supplement form, graviola can also lower blood pressure and help reduce stress. Doctors have begun investigating the chemical properties of the plant and its other potential applications in modern medicine. One major area that has been researched recently is cancer prevention and treatment, although testing to date has not involved humans, or even animals. Using results from in-vitro trials, independent sources have claimed that graviola can actually destroy cancer cells more efficiently than chemotherapy, while others suggest that it may help prevent cancer from spreading during its early stages. Recently, researchers at Purdue University conducted in-vitro testing that showed that graviola inhibits the growth of cancer cells. The plant was found to block and destroy cancer cells without damaging the surrounding blood cells, hinting that it may prove more effective than chemotherapy. Because this particular trial, and others like it, have been conducted in the highly controlled environment of a test tube, the actual reaction of a human body to any chemical or supplement derived from graviola as a method of cancer prevention is not known. To date, no research has been done proving the benefits of graviola for cancer treatment or prevention in patients. Rigorous testing involving animal and human subjects will be needed before definitive answers can be found regarding the role of graviola in the treatment of cancer. 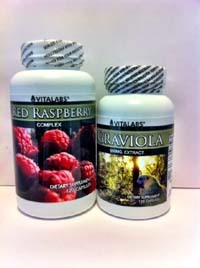 Graviola's potential as a cancer fighter will be determined by future research, but if you.re looking for a way to boost immunity or lower your blood pressure, you can benefit from the research that.s been done and buy graviola supplements today from A1 Discount Vitamins.